This week’s adoptable animals came all the way from Florida! Chicky and Ricki, along with dozens of other cats and dogs hopped a transport from a shelter affected by Hurricane Irma. They are available through Lost Dog and Cat Rescue Foundation, which also took in 22 dogs and 13 cats from Puerto Rico this week. To learn how you can adopt or foster one of these homeless animals, please reach out: [email protected]. Chicky had a rough trip to VA, but has settled in, and is enjoying life here now. Chicky is an outgoing lady — no hiding under the bed for her! Chicky is very affectionate with her host Mom; she seems to like having one favorite person. She enjoys petting on her own terms, but will let you know when she’s decided she’s had enough. When she is in the mood, Chicky will follow you around the room, purring, and looking to be petted or played with. When you pick her up, if you fully support her back feet and rump, she will put her front paws around your neck in a kitty hug, and will rub her face on yours endlessly! 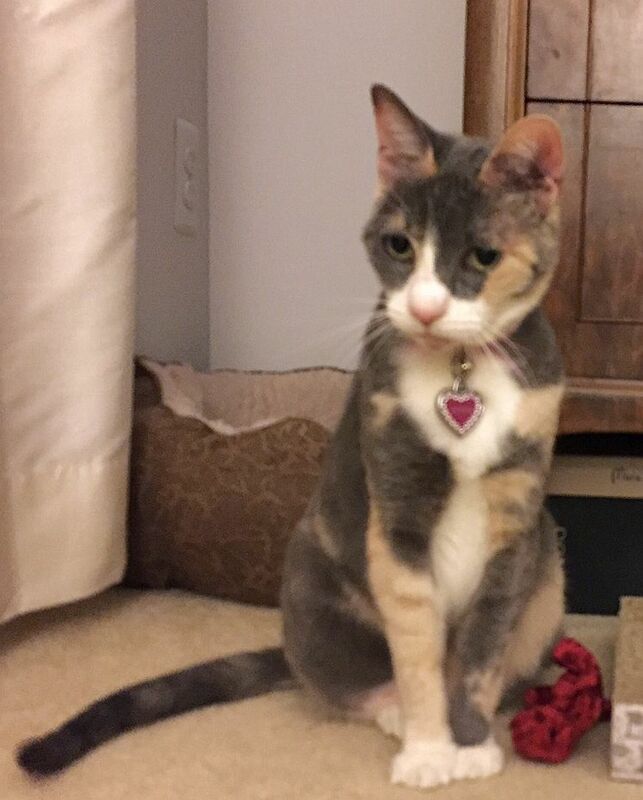 Chicky loves a couple good playtime romps each day with the laser pointer, string toy, or some catnip-infused balls. Chicky is not a lap cat so far, but she is very happy to curl up right next to you on the sofa. When not playing or showering her human with affection, Chicky loves to look out the window, perch on the back of the couch, or sleep in a sunny soft spot — especially a pillow on a bed or chair. If you want to help out a sweet kitty from the hurricane zones, come fall in love with Chicky and give her a cozy fur-ever home! Ricki is very excited to be in the DC area. She had been hanging out in a Florida shelter, but she heard there are lots of wonderful families here, and she hopped on the first bus. She is a great companion. She likes to go for walks, gives kisses, and never hogs the TV remote. 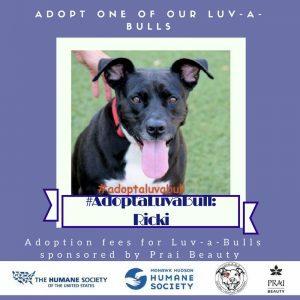 Ricki, Buster, and King are all participating in the Adopt a Luv a Bull promotion sponsored by Prai Beauty! This means their adoption fees have been sponsored for the month of October to help them find homes. Make sure to meet these guys this weekend and #adoptaluvabull.